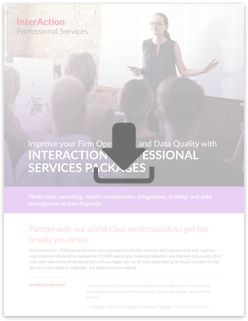 Improve your Customer Relationship Management (CRM) operations, maximize adoption, and improve data quality with InterAction® Professional Services Packages. Our world-class professionals provide consulting, report customization, training, and data management support services to help you solve your biggest challenges and speed decision-making. No matter what level of InterAction user you are, we have the service package that will fit your needs. Designed for maximum flexibility, our services plans allow you to customize your experience so you can focus on the areas where you need help with data management, workflow, reporting, and training. When you choose to work with our Professional Services team, we’re just a phone call away. Our team is dedicated to giving you first-class service, and is available via dedicated email, phone, and virtual remote meeting to help you with any issues that might arise. In addition, you can manage your request via our Service Plan Web Portal. Educate key employees to maximize your InterAction investment. Our trainers have extensive backgrounds in adult learning and InterAction technical knowledge. When you onboard a new employee, or give a current employee new responsibilities, we can recommend a set of role-based sessions. This will get them up and running quickly without draining your precious team resources. When you are ready to take InterAction to the next level by learning insider tips, we can tailor an education experience just for you. Save valuable time with reports professionally-designed for your unique needs. Whether you need a critical report or need to create templates for ongoing reports, our Professional Services team will work with you and help you think in new ways. Ready to talk about which Professional Services Plan is right for you?